Courses that help your staff write clearly and persuasively. Communication skills are the key to efficient and effective operations in business and government. New employees should brush-up on their basic written communication and plain English skills, while experienced professionals, burdened by the additional workload caused by downsizing and budget cuts, can also benefit. Our writing courses are designed for anyone who wants to improve their writing, including agency staff who want to improve their writing and comply with the Plain Writing Act of 2010 (H.R. 946) and Executive Orders 12866, 12988, and 13563. For more than 35 years, TheCapitol.Net and its predecessor, Congressional Quarterly Executive Conferences, have been providing training services. These programs and any combination of their topics are available as custom, onsite training. 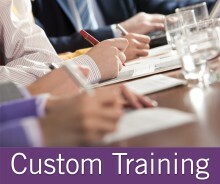 Custom training from TheCapitol.Net can help your new staff quickly fit into your Washington operation. Custom training programs are designed to meet your educational and training goals, each led by independent subject-matter experts best qualified to help you reach your educational objectives and align with your audience. Businesses, agencies and military organizations rely on TheCapitol.Net to keep their staff highly effective and aware.